Having a reusable shopping bag is more environmentally friendly than plastic bags. There are lots you can buy but why not make your own for a personal fashion statement. This design has two stages, first the sunset inspired strips and then fun with potato printing. If you can can bear to give it away, it would make a lovely present too. Lay the bag out and stick on strips of masking tape. The space between the masking tape will be where you paint. You can keep them the same distance apart or try different thicknesses. Put a sheet of newspaper or cardboard inside the bag to stop any paint leaking through. On the first space between the masking tape, use a soft paintbrush to paint the yellow fabric paint. Add a little red paint to the yellow and paint the next strip. Continue this process until you have painted between all the pieces of masking tape. While the paint is still dry, remove the masking tape to reveal your sunset inspired stripes. Follow the instructions for your fabric dye. I used dye from Dylon which involved letting the paint dry, washing the bag, letting it dry and then ironing to fix the colour in place. Next you're ready to create the elephant stamps to print on top. Cut a potato in half. Drawn an elephant outline. The simpler the better as it will make it easier to cut and print. Using a small sharp knife or craft knife, carefully cut around the elephant shape, leaving it sticking up. It's best to ask a grownup to help with this part. 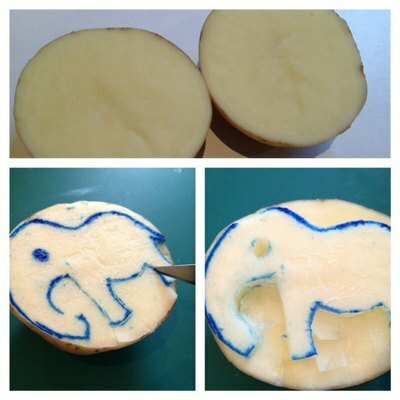 Paint blue fabric paint on the elephant part of the potato and press it onto the bag. Push down firmly and then lift off the potato. Follow your fabric paint instructions again and give the bag a good iron at the end to get any creases out. If you're giving this as a present, you could use your elephant potato stamp to make some extra special wrapping paper and a gift tag. Using regular paint, stamp a large piece of paper to making wrapping paper and a smaller piece of cardstock to make a tag. There are lots more ideas for printing, stamping and bags on this website. Genius idea and not too tricky either.